Bambi joined SWE in 1952 as a junior engineer at Raytheon. She was the SWE Boston Treasurer in 1954, served on the planning committee for the 1956 SWE Eastern Seaboard Conference, was the FY57 and FY58 SWE Boston Section Director (i.e. 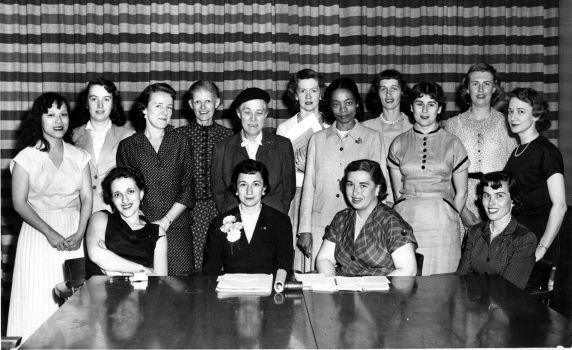 represented SWE Boston on the national board of directors…that BOD model was phased out in 1958 when it was decided that the BOD was vastly too large). In 1964 the women engineering students at MIT hosted a "Symposium on American Women in Science and Engineering," an informational 2-day outreach event for high school girls from 150 schools; Bambi and others held an informal evening chat to answer the students’ questions about the field. ​Inez Bellamy Hazel, age 93, passed away on October 15, 2013. She was born in 1920 to Josiah and Bertha Bellamy of New York City. She was predeceased by her older brother Athelstan A. Bellamy. Inez and husband Frank have been residents of Lexington for over 50 years. at MIT where she retired at age 70. Inez, affectionately known as Bambi, had a lively personality, wonderful sense of humor, generous spirit, quiet elegance, and keen sense of justice. She loved research and always amazed family and friends by championing ideas that were ahead of their time. Her love of music brought her much joy. Inez is survived by her husband of 70 years Frank Hazel, younger brother Rober t O. S. Bellamy; daughters Doreen, Karen, and Lauren, and their families. She was beloved Granny to 10 grandchildren, 11 great-grandchildren, numerous loving nieces and nephews, and many dear friends.